Fruit juices have today become an essential part of human diet and are preferred by all the age groups as they are a good source of instant energy and vital nutrients. Fruit juices can be easily obtained by extracting the pulp of fruits and are generally consumed as a beverage or may be used for flavouring in foods. According to a new report by Expert Market Research, the global market for fruit juice and nectars was worth 47 Billion Litres in 2018 and is further expected to reach a volume of 54 Billion Litres by 2024. 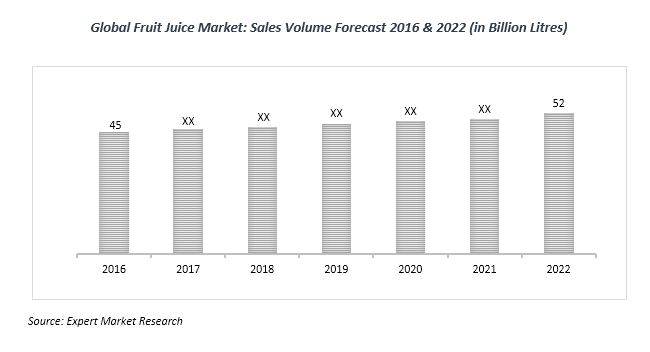 Fruit juice market represents one of the fastest growing sectors and is currently evolving at a fast pace. The global fruit juice market is gaining impetus due to a number of factors. Rising dietary and health concerns among consumers is one the key factors giving a push to the global fruit juice market. Owing to the high nutritional content and refreshing attributes of fruit juices, there has been a major shift in consumer preferences from carbonated drinks to the non-carbonates and natural beverages like fruit juices. Several other factors like population growth, increasing disposable incomes, product innovations, premiumisation and growing demand from emerging markets are also inducing the growth of the global market for fruit juices. Various flavours of fruit juices available in the market are orange, apple, mix fruit, grape and others. In 2018, orange represented the most popular flavour and accounted for the majority of the global fruit juice market. Orange was followed by apple, mix fruit and grape. Different types of fruit juices available in the market are frozen, chilly ready-to-serve, shelf stable and others. Region-wise, North America represented the world’s largest fruit juice market with a share of nearly one-fourth of the total global consumption. North America was followed by Western Europe, Asia-Pacific, Eastern Europe, Latin America and Africa and the Middle East. The market demand has more or less matured in the developed markets, so it is likely to decline in the coming years. On the other hand, the demand for fruit juices are expected to rise in the emerging market such as China and India. The global fruit juice market is surrounded by some of the top players, namely, Coca Cola, PepsiCo, Tingyi, Huiyuan, Wild, Jugos and Eckles. Coca Cola and PepsiCo represented the biggest global producers of the fruit juices. These players are coming up with new product developments in conjunction with technological advancements which have improved the marketing of their products like single serve aseptically packaged fruit juices, fruit roll-ups, fruit juice blends etc.